Can we see the Oblateness of the Earth on Satellite Images? According to geodetic measurments the shape of the earth is not exactly a sphere, but slightly bulged at the equator - oblate spheroid. In this article I show, that this small deviation from a perfect sphere can be measured on high resolution satellite images. Deutsch: Können wir die Abplattung der Erde in Satellitenbildern sehen? If the earth would not rotate, gravity would form the earth to a perfect sphere. The rotation around the north-south axes causes centrifugal forces perpendicular to the rotation axes outward. Because the earth is mostly liquid under the crust, it can be deformed by this forces, building a slight bulge around the equator. Some people call this Oblate-Spheroid. The technical term is Ellipsoid . Geodetic measurments reveal that the diameter pol to pol is Dpol = 12,713.6 km and the diameter at the equator is Deq = 12,756.2 km. The earth is said to be 42.6 km wider than high. The ratio width / height is: Deq / Dpol = 1.00335. Can we see this oblateness on satellite images from space? Lets find out. 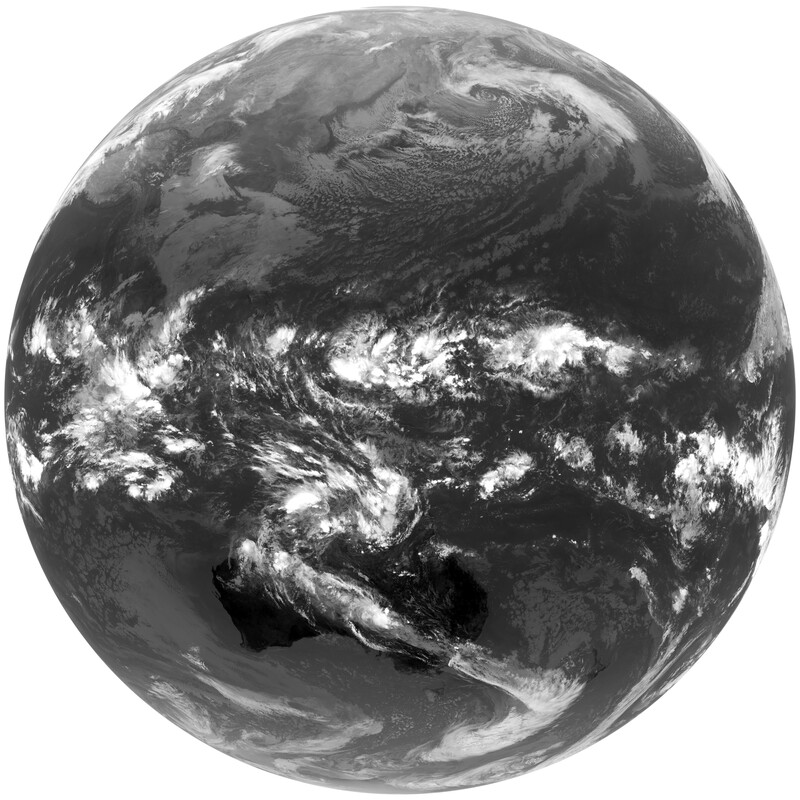 There are many weather satellites in geostationary orbits around the earth. They stay at the same point over the equator, because they orbit at the same rate as the earth rotates. One of the newest is the Japanese weather satellite Himawari 9 . It's image sensor has 11,000×11,000 pixel resolution, that is about 1 km/pixel. So this 42.6 km difference in the diameter should result in about 37 pixel difference in height. This should be measurable in a graphic software like Photoshop or Gimp. There are some problems though: The earth is not always lit by the sun exactly from behind, one of the poles is usualy not lit by the sun. Ideally we have to find an image taken at equinox at a time where the sun is exactly behind the satellite. Another problem is that the atmosphere has no sharp edges and is itself about 50−100 km high. From RGB images it is difficult to find an edge that can be used to measure the diameters accurately. But luckily weather satellites also take infrared images from the earth. In infrared imagages you can see unlit regions because the earth is emitting infrared radiation at night and day and the atmosphere itself is transparent. So we can get infrared images with sharp edges. At 02:40 UTC on 24 January 2017, the first images from all 16 bands were captured by JMA's Himawari-9 geostationary meteorological satellite, which was launched on 2 November 2016. The image shown above is the cropped version of the original image . To check the cropping I made, click here to get the full sized cropped image in a separate window, from where you can download it. Then open it in a photo editor of your choice (Gimp, Photoshop etc.). Set the zoom factor to greater than one (eg 4) and see how the edges of the earth touch the border of the picture. Check the dimensions of the image by right clicking the downloaded image and clicking on Properties. We can see, that the high resolution images from satellites show the real shape accurately within the error margins of ± 1 pixel. The oblateness can be measured from this images and match the measured values from geodesy. But the oblateness is to small to be noticed by the naked eye. So when dividing 2 numbers with error margins, their error margins add up. Summary: the oblateness of the earth as measured from the satellite image is equal the oblateness as measured by geodesy withing the error margins of ±1 pixel, see Result. How strong is the Centrifugal Force compared with Gravity? The earth rotates with a tangential speed at the equator of 1668 km/h! Should this not rip the earth apart? The precise strength of Earth's gravity varies depending on location. The nominal "average" value at the Earth's surface, known as standard gravity is, by definition : 9.80665 m/s2. So the maximum centrifugal acceleration at the equator is only 0.344 % of the mean gravitational acceleration. This causes only a very small bulge at the equator of 21.3 km. Name is displayed on your Comment. Email is only for the Admin, will not be displayed. You can edit or delete your Comment for some Time. External Links and Pictures will not be displayed, until enabled by the Admin.